Gateway to the Banu Protectorate! Corel is a standard type G main sequence star with six largely unremarkable planets located on the border between the United Empire of Earth and the Banu Protectorate, with a key jump line connecting the two. First discovered in 2449 and initially settled shortly thereafter, Corel has become the de facto customs checkpoint between the two states. The system itself was discovered in the decade following mankind’s first treaties with the Banu, as part of a concentrated effort to map this inhabited region of space. The inhabitable third planet, Lo, was developed first as a casual trading post between Humans and Banu and then ultimately developed into the port of call for all interspecies shipping traffic. The culture of the Corel system is an interesting mix of Human frontier and Banu bureaucracy, something that has not evolved elsewhere in the galaxy. Corelians today are an unexpected combination of efficient and laid back. Beyond that, in nearly five centuries since the system’s settlement, little has changed save the scale of what passes through the jump point. Corel System is one of the busiest tradeways in the Empire with long lines of ships waiting to clear both UEE customs and Banu trade guilds. The blending of these two civilizations is readily apparent on Lo (Corel III), where a large Banu population lives alongside Human settlers, creating a culture that is entirely unique to the area. 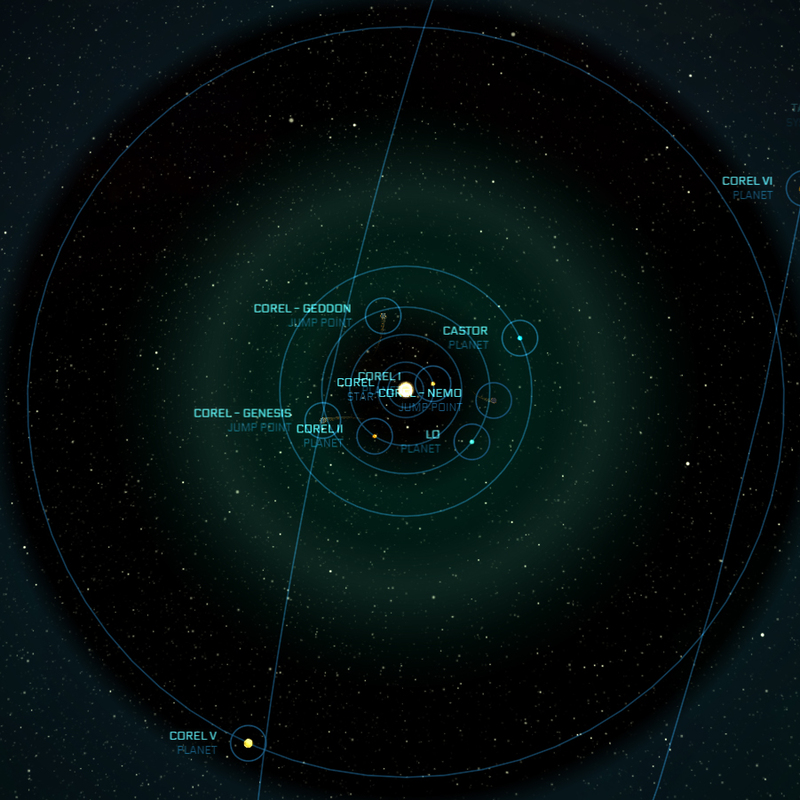 Besides Lo, Castor (Corel IV), a frozen desert world, is the system's only other populated planet, albeit sparsely. Corel is a Main Sequence Dwarf-G star. The crust and mantle of this planet have worn away, leaving its iron core exposed. A coreless world with no atmosphere, UEE surveys of Corel II have shown potential mineable resources, though the cost of exploring the possibility further has so far been prohibitive. A massive commerce and trade hub, Lo is one of the main transport hubs into Banu space. As such there is a large population of Banu who live here along with a small permanent population of customs officials and service industry workers catering to the constant stream of transients who take temporary residence on-world only as long as business demands. Pushed through the terraforming process during the Messer era, this frozen desert world would not meet today's more stringent terraforming requirements and maintains only a handful of scientific and military research settlements who appreciate the benefits of remote and sterile conditions. A gas giant with red and brown coloring. A small planetoid with an orbit well off the system's stellar plane.